Ugolini is a very well known and respected brand in Europe, but much less known here in Australia. This is changing. These marvelous machines are creating a reputation for incredibly innovative design, great build quality and faithful technical back-up. 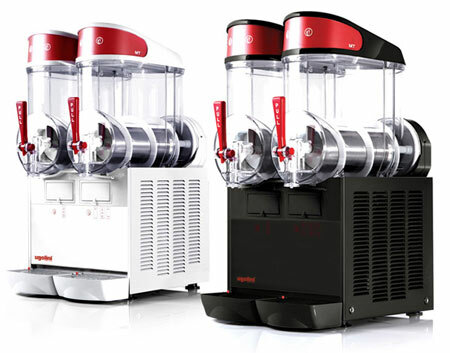 Following a two year trial period in which we replaced over forty of our own machines with these marvels, and sold about 100 more, The Slushie Co has been appointed the Australian sole agency for the UGOLINI range of machines. The Ugolini range are all built using the same ingenious, practical patented magnetic drive design. This amazingly innovative machine is perfect for the mixing of sorbets, frozen Cocktails, frozen yogurt, milk-shakes and, of course SLUSHIES including our healthy, school fruit-juice based Fruchilla Slushies. The motion produced by the twin inner and outer shaving and mixing blades mean you get a fabulously smooth mix. This means that there is no drive shaft inside the tank, and instead, the swirling ice-shaving blades are driven by a large, powerful magnet hidden behind each tank. Because of the unique doubled freezing surface area, this machine freezes up significantly faster than any other standard slushie machine. This is a big help in busy locations, or at events when demand can be very high. The twin-tank MT model, which compares with the size of the most commonly-used conventional machine, will hold 11+ litres per tank, and yet only measures 36 cms wide X 40 cms deep, and 69 cms high – and weighs only 37kgs!! Huh? Big Deal, you might think .. but, these are the easiest tap handles in the business to remove, clean and replace. The Magnetic Drive means there is NO drive shaft .. NO seals to lubricate!! This all adds up to cuting your hands-on cleaning time by much more than half from a conventional machine. Because of the lack of drives and seals and other design improvements, the Ugolini range is more reliable, for much longer, than any other machine. This last advantage is a huge benefit to you, as an operator, because it saves cost and down-time, and wonderful for us, because we no longer have to attend scenes of tragedy, where a machine has been fatally wounded because of a failed shaft seal that nobody noticed until it was too late!! Ugolini is a very well known and respected brand in Europe, but much less known here in Australia. This will change. Their marvelous machine are creating a reputation for incredibly innovative design, great build quality and faithful technical back-up. Following a two year trial period in which we replaced over forty of our own machines with these marvels, The Slushie Co took on the Australian sole agency for the UGOLINI range of machines.